Santa’s helpers welcome the children of Fantasy Flight to the ‘North Pole’ December 8, 2018. 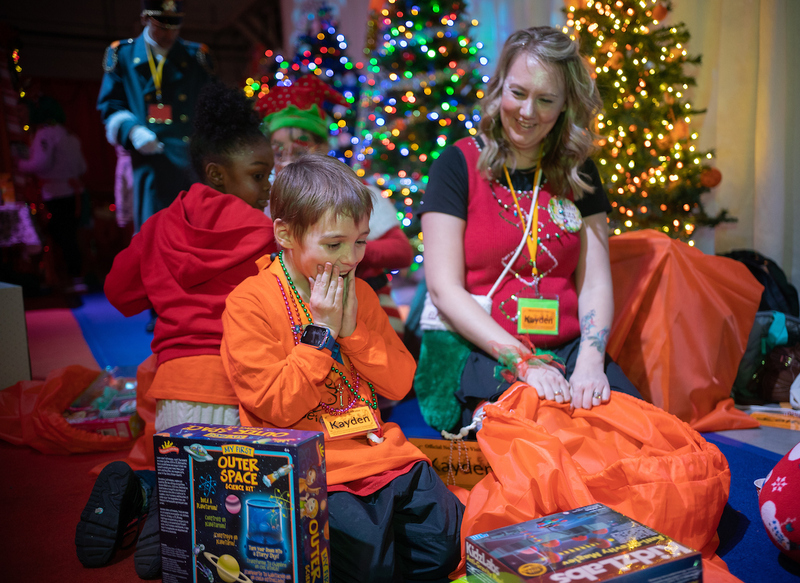 This weekend, our annual Fantasy Flight arrived at the “North Pole” to bring smiles and Christmas cheer to 66 children, many of whom live in shelters or transitional housing. For most of the kids, it was their first time on an airplane. But Flight 1225 (as in “Dec. 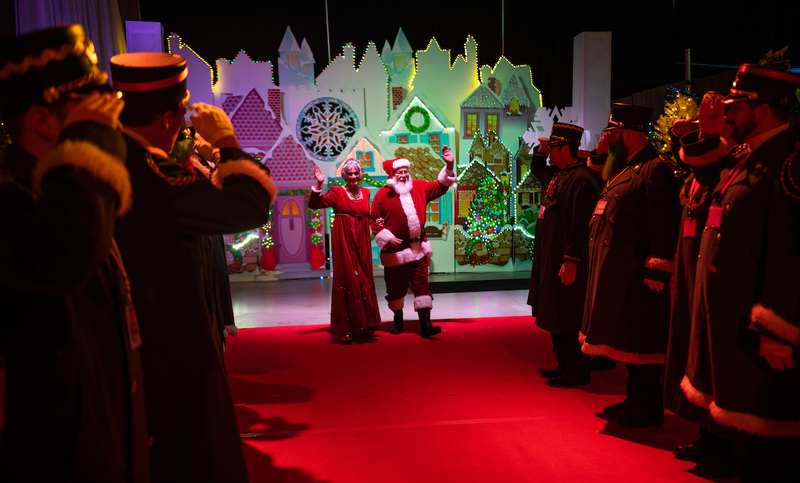 25”), which departed Spokane, Washington for Santa’s hometown at 4:45 p.m. this Saturday, was just the opening act; the kids finished their special day at an elaborately decorated party – a true winter wonderland. For kids who don’t have much, the special treatment provides a momentary lift this time of year – and memories to last a lifetime. While happy spirits fill the air, there are many poignant reminders of the difficulty each child faces. Last year, after visiting a booth to select pajamas, one girl put on her purple PJs as fast as she could, near tears, because she’d never owned pajamas before. 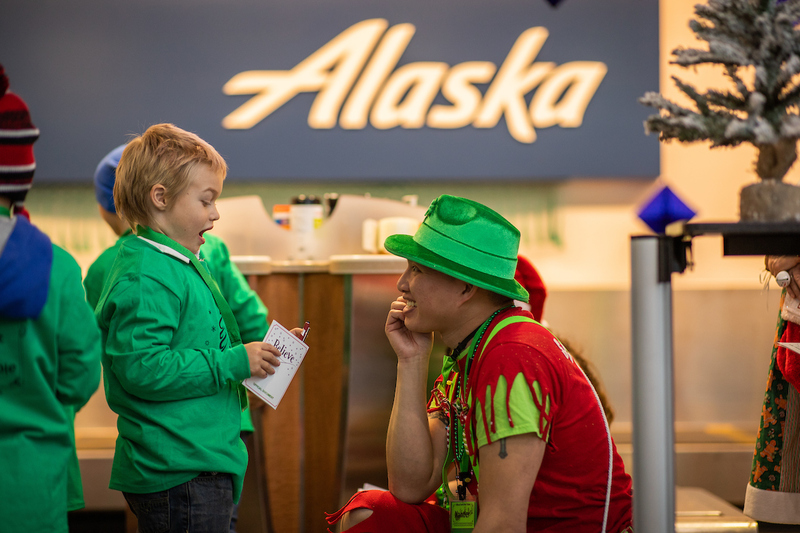 Since 2008, Alaska Airlines has sponsored the annual Fantasy Flight, with many Alaska and Horizon employees volunteering as “elves” ready to make magic happen. Santa’s helpers welcomed a school bus full of elves and children to the Spokane airport this weekend. Photo by Rajah Bose. The day starts en route to Spokane International Airport, where each child is given a “passport” to the North Pole and a personal “elf” that takes each child under their wing. Santa’s helpers greeted kids before boarding the 2018 Fantasy Flight. Photo by Rajah Bose. 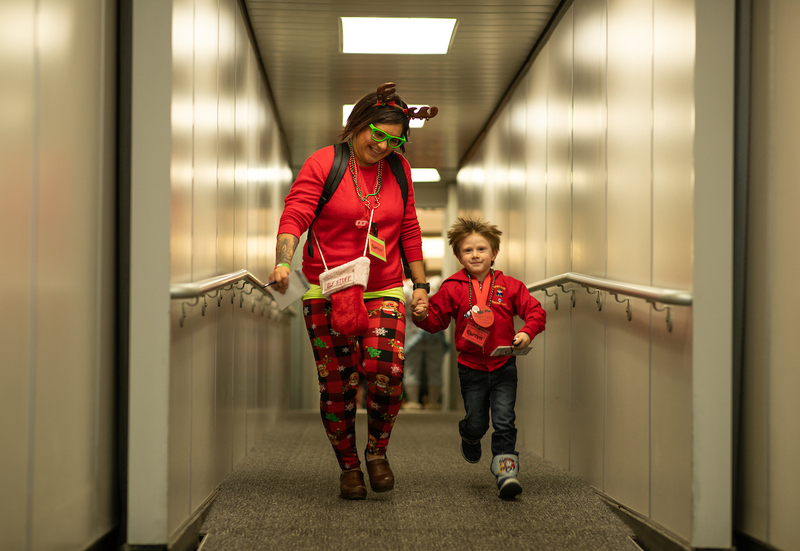 Santas elves helped travelers board Alaska Airlines special Flight 1225. Photo by Rajah Bose. SeeSaw the Elf got pulled out of the compartment where he was hiding as kids pelted him with ‘snowballs’ onboard Flight 1225. Photo by Rajah Bose. As the night winds down, the children gather around to hear Mrs. Claus read “The Polar Express,” the beloved story about a magical train that takes a group of children on a journey to the North Pole to meet Santa. Children received presents from Santa at the North Pole after Flight 1225 this weekend. Photo by Rajah Bose. Santa and Mrs. Claus made a surprise appearance at this year’s party. Photo by Rajah Bose. Children read with their elves at the North Pole after this Saturday’s Fantasy Flight. Photo by Rajah Bose. But first, each child gets a few more presents. Past Fantasy Flight photos by Ingrid Barrentine. 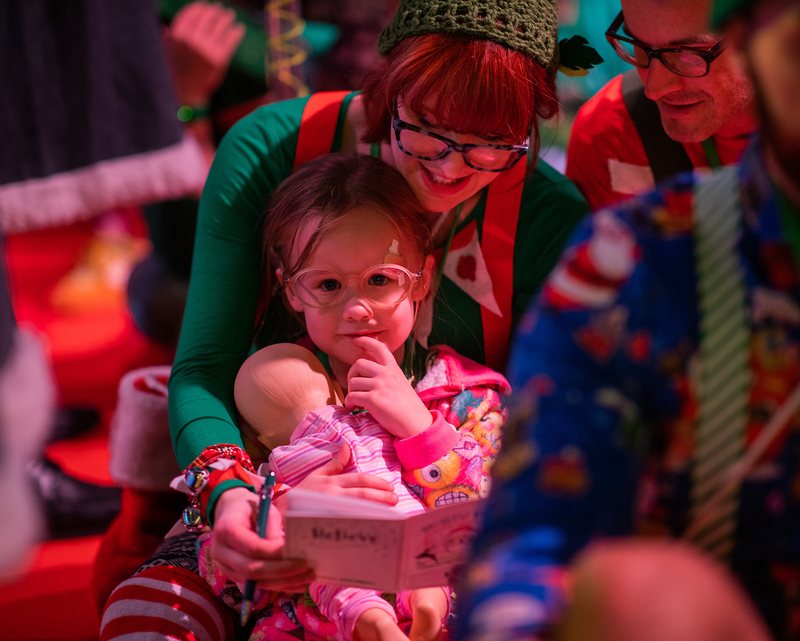 42 comments on "With help from Santa and his elves, Fantasy Flight makes life a little brighter for children in need"
This is one of the sweetest stories I’ve read! I would love to help out with this next year! What an amazing way to keep the holiday spirit alive in these children. Wow!! What a great way to spread the love! I am so proud to work for Alaska. With so many Alaska and Horizon employees wanting to be part of this event why not make it a selective process by employee recognition and being able to take part in such a great event. This is fantastic way to recognize great employees!! GREAT job GEG Horizon staff!! You guys always do an awesome job for this amazing event!! Well done volunteers and donors, what huge hearts. Kudos Alaska Air, keep up the good work. Peace to all. I would love to be an elf next year! how do I go about making this happen? Hi Tish, I’m looking into this for you! I’ll be in touch. I also will love to be an elf please let us know what we need to do please!! I would love to be apart of this too! While this was a beautiful gesture that brought tears to my eyes, I couldn’t help but notice what an incredibly Caucasian event this was. I know in my heart it wasn’t by design but really not one photo of an child or elf of color. Great observation, Dan. Thanks for speaking up. Glad to see this point made. There is beauty in diversity. This Is truly the most beautiful Christmas story I have read in years. I am tearing 30,000 feet in flight. Thank you for reminding us of the importance of giving, uplifting children in need, and the spirit and magic of the season. Bravo! Alaska amazes me every single day! What an opportunity to be part of such an event! Job well done!!! This is so amazing!! looks like so much fun! How do I become a volunteer for this next year? I would SO LOVE to help. Thank you! HOW DO THEY GET BACK TO SPOKANE AFTER THEY ARE DONE AT THE NORTH POLE???? Does the plane fly them back??? This is one of the coolest things I’ve ever seen! This is why I love working for Alaska! Best airline around! After reading the story I had to wipe a few tears, this is so wonderful …… for employees to be able to make children smile and feel warm and safe. Worry-free even if just awhile…. I absolutely love this company I am so lucky to work for..
“I’ve never had my own blanket before” & near tears after putting on her pajamas right then and there.. “I’ve never had pajamas before”. The reality of this situation is sobering. Kudos and more to Alaska Airlines and all of the volunteers that have given these kids just one night of magic in what must be an otherwise very challenging Spokane winter. My daughter-in-law, Dawn Ellis is one of your Elves. I would be interested in helping with this or with your Honor flights in the future. Tony, a friend of my niece, from the police dept was involved with the Honor Flight program. Please contact me if you would like my help as an Elf or if you need donations of gifts. 1-509-238-5176. So glad Alaska Airlines does this. ???????????????????????????????????????? I just love this. Thank you, Alaska, for giving these kids a memorable holiday. Alaska airlines is like no other airlines. I call myself the official unpaid spokesperson. I fly a lot and I am a 75k gold. The team at Alaska is so much better than any other airlines I have flown…. Another reason to love and fly Alaska Airlines! As Santa says in the Polar Express, “Just remember; the true spirit of Christmas lies in your heart.” That is so true and to echo the comments by Chief Elf Bernie Claus, Alaska Airlines has the skills and heart to support such a worthy cause. Alaska Airlines also supports ‘Honor Flights’ which takes war veterans to Washington D.C. This past September I was in Arlington Cemetery when several buses with those veterans arrived on site; it was humbling to see their reactions to being there. They say that actions speak louder than words and that’s what makes Alaska Airlines different from the rest. We always encouraged our two sons to chose carefully what careers they entered and for whom they worked. How ironic that one of the biggest “kids” (our oldest son) who grew up with the Polar Express and knows “that the bell still rings for all who truly believe” … is now a pilot for Alaska Airlines in Anchorage. Kudos to every volunteer for these two wonderful activities, but even more praise for such a fine company that enables them to happen. No wonder his dream job was working for Alaska Airlines! As Chief Elf of this event, it is a humble honor to have Alaska Airlines as our flight partner! With Scott and Erik up front; Joanie, Carole, Vicki and Denise running the cabin, 57 children and 123 elves .. it was the memory ride of a lifetime! Only Alaska Airlines has the skills (and heart) to support the adventure and they’ve done it for 10 years in a row! From the board of Northwest North Pole Adventures, the 257 elves, and over 200 more volunteers (just elves without their glitter on) .. thank you! And folks, on your next Alaska Airline flight, check the seat pocket .. if you find some glitter, we left some Christmas magic for you to enjoy! You guys are the best! Thanks for making some lucky children so happy. What a marvelous, heart-warming story! Thank you for bringing so much joy to so many children. Just another reason why we love our home-town airline! Thank you for thinking of others this holiday season. Thank you for your kindness & generosity to these children….with the true spirit of Christmas shown. I started flying Alaska Air in the 80s from Seattle to Alaska and now Tampa to Seattle. The employees are the best and wish all a Merry Christmas! This story truly touched my heart. I love you, Alaska Airlines for so many things, including this and wonderful nonstop trips to Kaua’i from San Jose. What an amazing and wonderful thing to do for these children! Thank you, Alaska Airlines for your incredible caring and kindness! Absolutely love you guys! Thank you for brightening these kiddos lives, even for a short time! How I love Alaska Airlines!! So glad you are our only airline! You make me so proud to be Alaskan. What a wonderful and caring tradition, Alaska Airlines. You are all fantastic ! This is why Alaska is and always be the best airline in the world. it is more that dollars, it is community and heart. Y’all continue to impress me, Alaska Air. This story along with how you operate your airline and your exceptional customer service makes you our go-to airline of choice. You’re an example to other airlines! Keep up the great work! This is amazing! Thank you for doing this, Alaska!